Tracer to collect link-layer rate information about links. Definition at line 39 of file l2-rate-tracer.hpp. Definition at line 84 of file l2-rate-tracer.cpp. 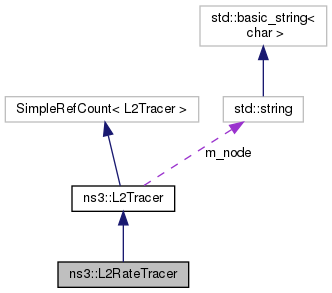 Definition at line 91 of file l2-rate-tracer.cpp. Helper method to install tracers on all simulation nodes. Definition at line 48 of file l2-rate-tracer.cpp. Explicit request to remove all statically created tracers. 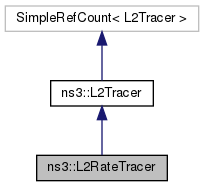 Definition at line 42 of file l2-rate-tracer.cpp. Definition at line 97 of file l2-rate-tracer.cpp. Definition at line 114 of file l2-rate-tracer.cpp. Definition at line 158 of file l2-rate-tracer.cpp. Definition at line 166 of file l2-rate-tracer.cpp.